The Gunnison Bluffs West trail is located along the Gunnison River just south of Grand Junction, Colorado. 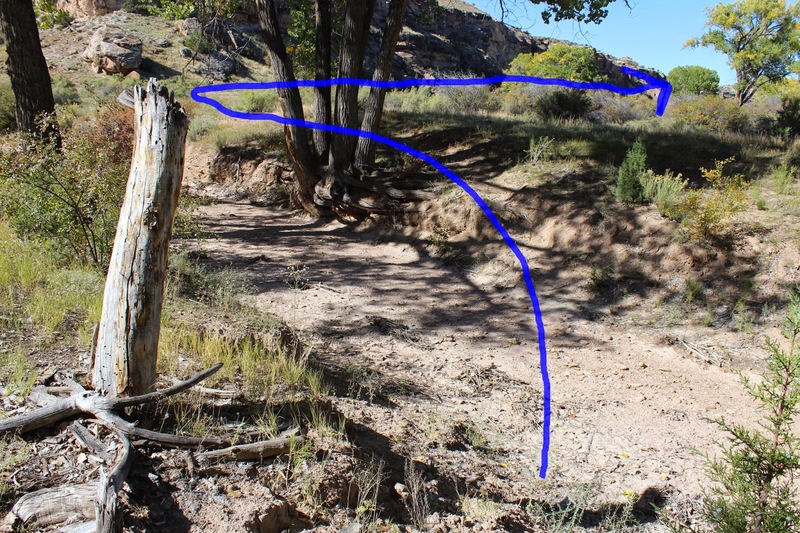 The trail begins off of Highway 141 where it follows the route to the lower end of Bangs Canyon before taking off on its own along what appears to be an ancient trail above the west banks of the Gunnison. That said, this isn't an official trail and it doesn't start from an official trailhead. 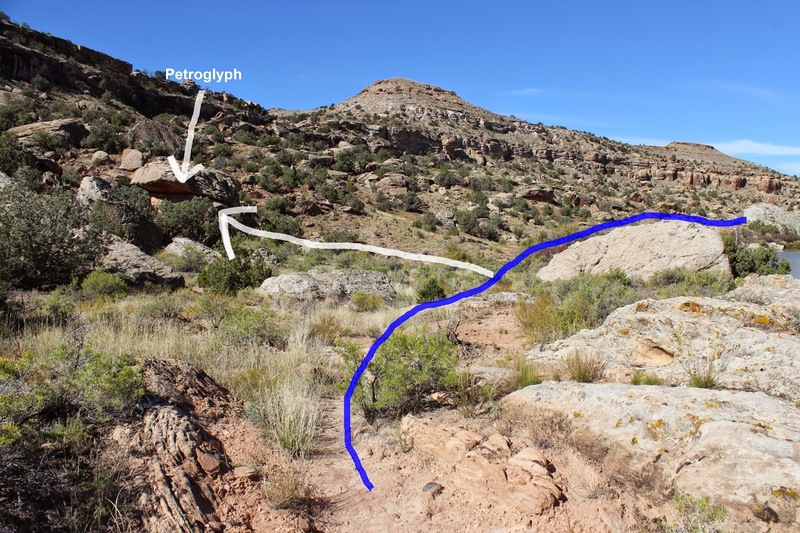 We posted it here for the historical nature of the trail and because of an interesting archaic period petroglyph we found along the way. CAUTION: This hike is probably not for the casual hiker. The parking area can be found off of Highway 141, just before the bridge over East Creek. Measure about 1.4 miles from the junction of Highway 141 and Highway 50 on the outskirts of Whitewater as you head west toward Gateway. Pass through the gate and follow the well worn trail up the side of the hill. To see some other interesting petroglyphs check out the East Creek Petroglyphs I post. At the point where the trail levels off it connects with an old jeep road. The land to the right is private property and should be avoided. Continue straight across the road and drop down into the draw. From this point follow the directions for the Lower Bangs Canyon trail. Basically there isn't a trail from this point so route finding amounts to hiking down the draw and picking up a fence line that borders a gravel pit pond and following that to the mouth of Bangs Canyon. Right before reaching the mouth of Bangs Canyon there is a gate to pass through. Once at the wash cross it rather than heading up the canyon. Once on the other side of the wash follow the base of the mountain. Stay close to the mountain and away from the river to find the trail that is going to eventually appear. The brush, mostly greasewood, can be a real pain to hike through at this point but it gets better after a hundred yards or so. Also, during the spring months the wash will be flowing water making it more difficult to cross. Once the trail that runs along the mountain side on a small bench above the river is found the rest of the hike is much more obvious. At the 2 mile point the trail passes through the gate of an old fence line. Continue following the trail as it heads in the direction down the river. Avoid any side routes that lead away from the river. 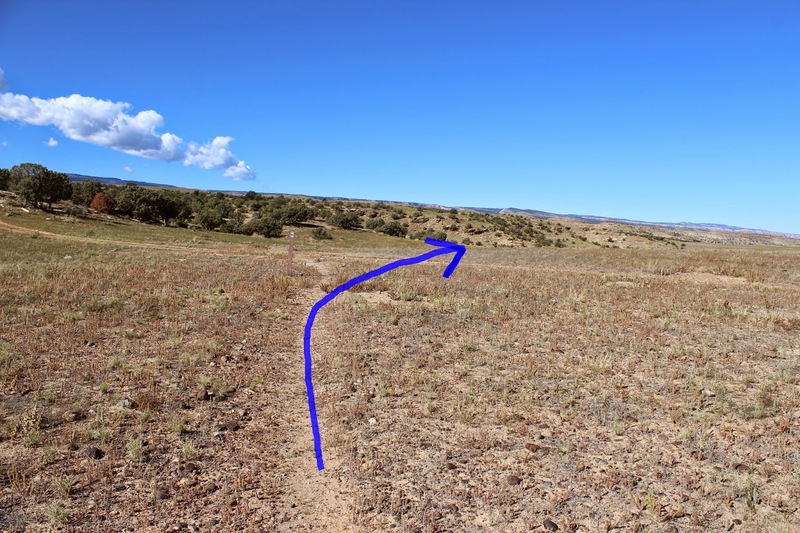 There is one trail, if you happen to find it, that will lead all the way to the top of the mesa and toward the Tabeguache Trail. At about the 2.7 mile point the trail is becoming very close to the river. To the left of the trail there is a large boulder pointed to in the above picture by the white lines. This is the boulder with the petroglyph on it (N38 59.1540, W108 29.9225). The boulder has an overhang on its south side and that is where the petroglyph is. We found it because we were exploring a rock shelter next to the river on the righthand side of the trail at this point that had a lot of chips of chert. It looked like someone had spent quite a bit of time in the area so we considered that it may have been a meaningful place to them and that there might be a petroglyph nearby with a clan symbol or other important icon. The large boulder looked like a good candidate and our hunch paid off. 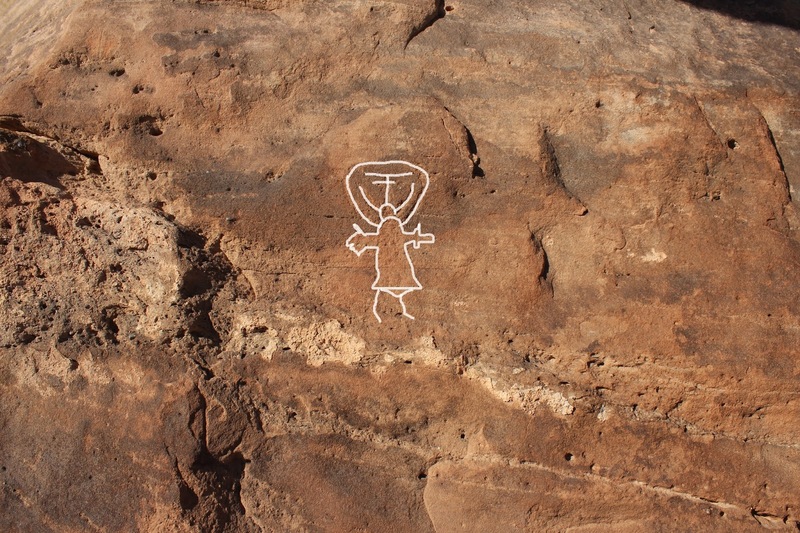 Here is a trace of the petroglyph that we did on our computer. Even though the style looks very familiar we haven't taken the time to compare it to any of the thousands of other petroglyphs that we have pictures of. We might not get around to it until we get too old to hike and have nothing else to do. The rough trail continues along the bank of the river. We followed it for about another mile where it reached an old homestead. As near as we can tell one Henry E. Lopas received patent for 64 acres of land here on August 27, 1907. Land Patents were meant to transfer the ownership of public land to individuals for the purpose of mining. If any mining was ever done here it would have been a placer on the Gunnison River as no shafts or tailing piles appear to be present anywhere on the property. Many times the patent claims were a simple ploy to grab land for the paltry sum of less than $5/acre. Henry's name shows up on several other patents, as well as court documents, and in the Locomotive Engineers Journal. Here is a coyote that was spotted on one of our trips in the area. We have also seen fox, deer and bald eagles on other occasions. We normally don't post hikes that aren't official trails anywhere other than around Grand Junction. It is hard to recommend a hike to someone when there isn't an official trail to follow. We spend a lot of time exploring the area in the off season and sometimes we stumble upon something that we feel is worth sharing. Anyone that wants to try their hand at following the route that we did in this post can do so easily by loading our GPS track into their own unit. For those that don't have a GPS we recommend studying the map and the slideshow that follows before venturing out. Seeing that the route runs between the hillside and the river it is doubtful that getting lost would be an issue though falling into the swift waters of the Gunnison River would be unfortunate. If you would like to see it for yourself then all you have to do is 'Take a hike'.